If you're traveling to Lisbon for your team building event, there is no better way to end the day than with a Lisbon Street Art Tour. Be part of a Lisbon Street Art Tour and meet the most iconic artworks spread out through this amazing city. Every corner will surprise you. Our artists are experts in the topic and will tell you secret stories about each art piece that you would not be able to know about otherwise. This is a Lisbon Street Art Tour that plays with mix and match. It starts right in Praça Luís de Camões and will take you through different historical neighborhoods in the city. Their stories are told through art in the Lisbon streets. 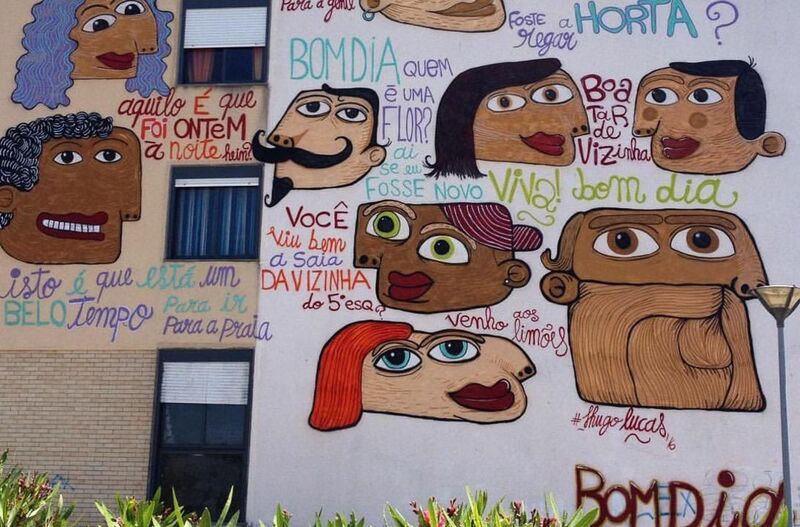 Starting in the multicultural hotspot Martim Moniz and continuing into one of the highest viewpoints of Lisbon, this Lisbon Street Art Tour will take you through the historic and artistic streets of Alfama. The perfect scenario for your team building event! What once was an industrial area cover in gray tones turned out to be a colorful canvas. From the buildings off the highways to the narrow streets and quiet neighborhoods, Alcântara is the perfect place for your Lisbon Street Art Tour. For the Street Art enthusiasts, you can have a longer tour with a small break where you can experiment with some spray paint on the wall. To end your Lisbon Street Art Tour, you will also be given a touch of sweetness with local pastry.